You can take AREX(Airport Express) at B1 floor, the transportation center in Incheon Int’l Aiport. AREX is available from Incheon Int’l Airport to Seoul Station. At Seoul Station, you can take the Gyungbu Line (to Busan/KTX). Incheon Int’l Airport Station is both on the B1 floor in the transit center. You can buy your tickets from information center or ticket machine marked above, and check the time table attached below. Airport Rail Station 1F of the passenger terminal » B1F of the passenger terminal » Using moving walk and go straight » AREX Station » Go to the ticket box which is located on the right side of the main gate. (1) Purchase the KTX ticket to Busan KTX Station at the ticket office on the 2nd or 3rd floor. The tickets are issued for a particular departure time, train number and seat number. Go out through Exit 3 or 4 at Busan station. You can find Busan station square. 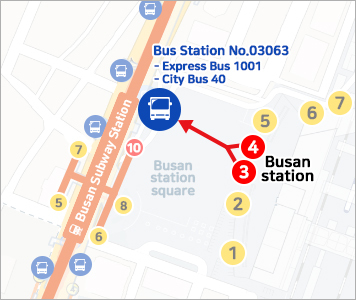 Right side of Busan Subway Station Exit 10, You can find Bus stop (Bus Station No.03063) and take the Express Bus 1001 or City Bus 40 to go BEXCO. Get off the bus station 'Centum City Station (BEXCO)', then You can find BEXCO. Please refer to the time table and route guide below. If you take a taxi to go to the Venue ‘BEXCO’, please print and show this message to taxi driver. 벡스코(BEXCO)에서 개최되는 ICSM 2018 학술대회 참석을 위한 참가자입니다. 안전하게 벡스코(BEXCO)까지 모셔다 주시길 부탁 드리겠습니다. 감사합니다. If you have any questions or need some help, please contact us. Copyright (c) ICSM 2018 All Rights Reserved.